Detroit has been swarming with news in recent weeks. Detroit Red Wings, Henrik Zetterberg isn’t expected to participate in training camp and, likely, the regular season. With the loss of their captain, the remaining Red Wings will face increased responsibility. The rising stars and current skaters will have to significantly ramp up their game in the absence of their leader. The Grind Line decided to take a look at the team’s roster players that need to improve the most. Though they are all talented, there is always room for improvement. It shouldn’t surprise any Red Wings fan, to learn that the struggle to produce is an ongoing battle. This week, we will lay out who we think could use some extra fire under them and where they need to improve. Justin Abdelkader was once a force to be reckoned with. His AHL career with the Grand Rapids Griffins sparked an interest in the fiery forward and as he battled his way through the NHL, he proved a worthy investment. He is not a mega-point producer however, his physical game has been a spark plug for the team. Who could forget the brawl that ensued after Abdelkader wailed on the Tampa Bay Lightning’s Mike Blunden during the 2015-16 playoffs? His physical presence and ability to get the puck to the net has contributed to the other forwards’ success. Abdelkader’s production peaked in the 2014-15 season but has been inconsistent since then. Fluctuating but never exceeding his career-high of 44 points, his presence has all but disappeared. In light of the changes coming to the core leadership group, Abdelkader needs to assert himself again. Not in a face-pounding way, but in the strong net-front play and play-making that once defined him. He’s a workhorse, very strong and competent. He has the makings of an incredible leader and, at one point, I considered him a great candidate for the captaincy. He needs to ramp up his shots, forecheck and his overall physical presence. His shots decreased by more than 50% from 2014-15 to 2015-16 and have continued to wain since then. He has experience and strength but has allowed it to dwindle. In Zetterberg’s absence, Abdelkader has an opportunity to not only step up his production but prove himself a worthy leader. Last year was a tale of two seasons for Danny DeKeyser. The blueliner was injured in the first half and struggled to find his game, while the 2018 portion of the calendar was more favorable. Ideally, the Red Wings need a consistent 2018-19 campaign from their defenseman with the most term left on his contract. DeKeyser was signed to a six-year, $30 million deal to become Detroit’s go-to rearguard, but has fallen short thus far. 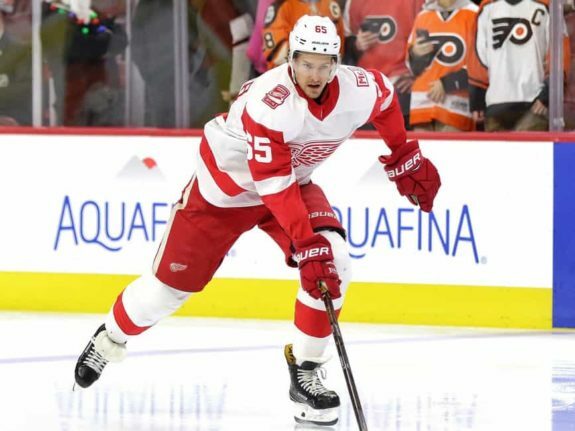 As the team rebuilds and gets younger, they’ll need DeKeyser to step up and become dependable on an everyday basis. While he’ll never score 10 goals in a season or reach 40 points, DeKeyser does have the ability to join the rush more often and make strong passes out of the defensive zone. In addition, he needs to get more shots through from the point – he averaged an even one shot per game in 65 contests last season, ranking 162nd in the NHL. For a top-four defenseman, that’s not good enough. DeKeyser’s defensive zone presence needs to improve as well. Being stronger on the puck and more of a force in the corners and in front of the net will help. He needs to use his six-foot-three, 191-pound frame to gain more leverage and box out opposing forwards. Finally, having the composure to make quick decisions and simple plays to move the puck effectively will go a long way with a defensively impaired team like the Red Wings. With Zetterberg expected to miss the 2018-19 season, Nielsen is set to take over the No. 2 center role behind Dylan Larkin. It’s a role Nielsen earned as a member of the New York Islanders, where he was a reliable two-way center behind John Tavares. #RedWings Blashill said if Zetterberg doesn’t play he’ll move Andreas Athanasiou to 3rd line center, behind Dylan Larkin and Frans Nielsen, with Luke Glendening centering fourth line. 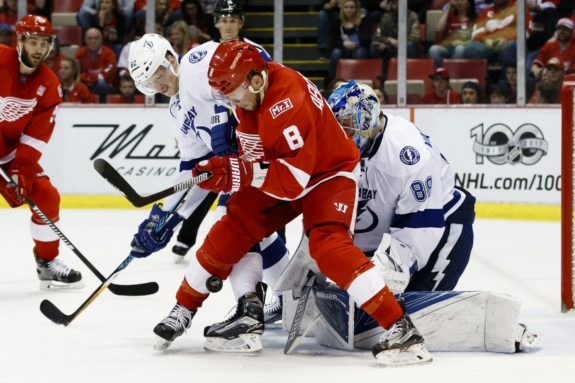 Darren Helm will play wing. Nielsen was tasked with taking on tough defensive matchups while providing a fair amount of offense as a solid 5-on-5 and special teams asset. Since joining the Red Wings in 2016-17, he’s been underutilized during the youth movement. During Nielsen’s first season in Detroit, the veteran posted a career-worst minus-19 rating and 41 points (17 goals, 24 assists). It was his lowest goal and point total in a full season since 2009-10 when he scored just 12 goals and 38 points. His offense took another hit last season, where he averaged 15:50 of ice time per game, his lowest since the 2007-08 season. At 34, Nielsen is slowing down but being placed back in the top six will give him a bit of a bump in ice time. He’ll also be surrounded with better players—his most common linemates in 2017-18 were Darren Helm and Justin Abdelkader—where his vision and passing can help offset his declining offense while helping to boost the more consistent offense on his wings. Without consistent play from Nielsen, the Red Wings will be far too reliant on their top line, pending a huge season from a rookie or breakout player. The loss of Zetterberg will leave a gaping hole down the middle and after Larkin, Nielsen is currently the only player capable of solidifying the center depth in Detroit.